Do you have a bathtub? And is it your favorite one? Congrats! Now imagine, you stepped into your bathtub, turned on the faucet, leaned back in the tub and closed your eyes. But, water is drifting away here and there. Or the water pressure of your shower head is so harsh that it touches you! How was that? We assume that was not so romantic but an awkward one. So, you should be very careful selecting your faucets. In fact, you need to choose the best bathtub faucets for your own good. In the beginning, faucets are not as charming in design, affordable or user-friendly as they are now. Did you know gold, silver even marble was used to make bathtub faucets? But, now you have a variety of tub faucets which are different in designs, colors, and materials. Most of all, it is simple to use. A lot of brands are available in the market now. It is difficult to slight down the list and choose the right one without using it. And trust us; reviews are not always helping hand. Worry not; we have some tremendous experiences regarding this. So, we thought why not sharing with you? 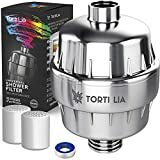 Let’s find out the best bathtub faucets in no time. 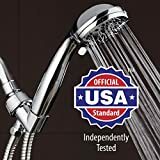 How Do We Pick The Best Bathtub Faucets? To find the best products and narrow it down for you is our honor. We know you have a headache regarding this. And it is our sole purpose to vanish the headache of yours. You can say, ‘why not see the ratings and make the purchase.’ But what you think all the dear reader? We think you need more than this. You need to know the features, colors, designs, materials and much more to buy the best bathtub faucets. We have not only decorated the review by ratings. We went inside of the product details, customer’s satisfaction and dissatisfaction, price and comparison and much more. Do you want to see we are bluffing or not? Then what are you waiting for? Let’s find out. Do you need a diverter tub spout that is both simple and awesome? Then American Standard 8888.026.002 is your best option. It has an elegant design, brass construction and made of chrome. It is 4 inches and designed for ½ cooper water tube. These are the features. But do you know the best part is? You can install it very easily. It will take less than 5 minutes to install. Along with that its price is pretty standard. Not only that we have many reasons to like it. Hop into next phase to know why we like it. We noticed some water leaking problems in American Standard 8888.026.002. But we think this is not a major problem. If you assemble the tub spout correctly, then it isn’t an issue at all. If you are encountering leak problem check the pipeline or valve. If you got any problem, fix it and stay happy. ‘Honey, can you check the taps? There is the low water pressure in the shower head here.’ ‘All good here honey. Finish your shower and find the problem.’ Is this your daily scenario? 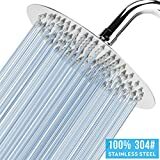 Then you should rethink about your shower head. And KZKJ High-Pressure Showerheads may be the best shower solution for you. 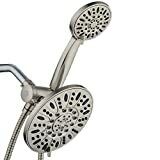 It has a 4.2-inch shower head that ensures high-pressure water flow. Modern design, a High-quality material with a premium chrome finish makes it unique. If you want uncompromising high-water pressure support, then you should consider this. Let’s check other benefits to set up your mind. KZKJ is a good shower head although its water pressure flow reduces from time to time. It is not that big as you are thinking. 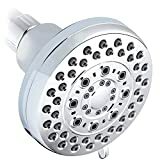 Clean up your shower head if the pressure reduces. You can also get high pressure by removing its flow regulator. Super water flow is the main feature of ProPlus Diverter Clawfoot Tub Faucet. If you want heavy duty tub faucet, then it should be your first choice. The unique rock-solid design gives it a tough look. Solid Brass chrome plated color is one of its noticeable features. Its bath lock lift diverter lever handles and casts brass waterway. Another important thing, if your tub is old fashioned, then you should definitely check it. You should see others benefits to make take the decision. If you add a rubber gasket to ProPlus Tub Faucet, it will work fine. 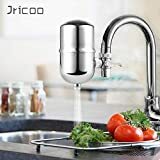 If you want to try a heavy duty Clawfoot tub faucet with a low price, then this faucet is the best choice or option for you. Do you want to save your money? Just kidding, who doesn’t? So, here it is. Your cost saver tub spout is Delta Faucet RP17453. It offers fast shut off to reduce water leakage. It has pulled down feature. It is 6-inch total length and coordinates with the Delta classic collection. It is made of plastic. But you don’t have to worry about repair parts. It has genuine Delta repair parts. It is easy to install. A baby can operate this tub spout. Just pull down to divert. It is suitable to sweat or thread onto ½ inch pipe. Apart from these, we recommend Delta Faucet RP17453 it for other reasons too. Let’s advance to our article. Delta RP17453 Tub Spout is a high-priced plastic product. It needs some plumbing work. But its functions are really cool. It will save your money by saving water resources. It has an easy divert option. More of it, it has original repair parts. Delta RP61357BN Diverter Tub Spout that reflects your aristocracy. If you crave for beauty and style, then you must consider this tub spout. Its brushed nickel color reveals splendid and precious look. There are no plastics parts in it except actual diverter. It needs to thread into the nose spout, but it is very durable and long-lasting product. It has also genuine repair parts. It best coordinates with Foundations and Windmere collections. But that’s not all, see for yourself. It is made of metal but has no adaptor in it. You will not regret its aristocratic look. If money is not your problem (for buying extra parts) and you want the beauty, then Delta RP61357BN is your thing. But alone, it is a cheap one. One word ‘outstanding’ can be told for Kingston Brass KS266C Wall Mount Tub and Shower Faucet. It is an extraordinary design that you want to acquire. It has both brass and solid brass construction. This product has four eye catchy colors that will blow your mind. Max 2.0 GPM/7.6 LPM flow rate on hand shower at 80 PSI which is compliant with California Energy Commission title 20. It is for bathroom wall mount use. It needs a ½ female stub out on the wall for installation. We think you will like it for the features below. Although it has some color fading problems in oil rubbed bronze color. But it can be solved through extra care. You can check the other colors as the other colors have no objection to color fading. You may need some extra parts to assemble it. But it will worth your money. Do you like the curved design? How do you feel if it carries lifetime limited warranty? Yes, Peerless PTT298696-BN Two Handle Roman Tub Trim has it all. You will be surprised or amazed with its modern style with 3 different color finishes. It can flow at 18-GPM, 68 liters per minute. 2 easy going handles will ease your effort. It needs R2700 delta valve to complete the three-hole 8-16 installation process. We think you will love this product when you read our recommendations. Although the handles need to tighten sometimes, it isn’t a hard task. You can consider Peerless PTT298696-BN if you want a curved design with a limited lifetime warranty. If you need a simple design and front diverter with the front connection, then Westbrass E531D Front Diverter Tub Spout is your best option. It is made of zinc which provides sturdy functionality. It fits with any ½ inch IPS thread-on connection. It is simple yet classic and versatile polished chrome finish. Moreover, it is a budget-friendly product that will do your work. Its size 5-¼ inch fits most tubs. See the points below to know why we like it. Westbrass E531D is a good product comparing its price. Although it has some small issues, it won’t cost you more. So, if you want to try cheap tub spout then give it a try. You won’t regret it unless you want the best. ‘I want ultimate performance whatsoever’ is it your motto? Then Delta Faucet U1072-PK Diverter Tub Spout is your ultimate choice. It is strictly te tested to ensure quality performance. Chrome finish with the same color outbursts its beauty. If you want to see what Delta can do, then you must try it to test your satisfaction. We recommend it if you don't spend more time on performance and beauty. See our recommendations to match your taste. Check the inner valve. Most times water leak causes due to an inner valve problem. If you find it then replace the faulty parts and assemble it to fix the leak. If you want better performance, then you must try Delta Faucet U1072-PK. Although it has some leaking issues, it is tough on duty. If you can assemble it, then there isn’t any problem at all. You can use it many years as it carries 10 years residential uses warranty. 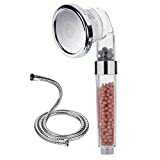 If you want an elegant upgrade to your bathroom, then Moen 3931 Replacement Shower Tub Diverter Spout is your best option. It offers a unique design that matches nearly any bathroom style. It is made of plastic, but this bathtub spout features reflective mirror-like the chrome finish. It is easy to clean. It is wall mounted spout with 5- ½ inch length. This tub diverter spout is backed by limited lifetime warranty. Do you need anything more to choose this product? See why we like it then decide. If you can assemble it right, then there will be no leak. If it continues to leak again, then fix the inner parts. With this elegant like the design, it reflects a true beauty. Although it is made of plastic, it is durable and long-lasting. You should consider Moen 3931 as it backed by limited lifetime warranty. Wuhoo! A long article, isn’t it? But to us, this is important that you can get enough info to make your decision. I think you made up your awareness already. But our duty is not finished. We want to give you some extra insights of these best bathtub faucets. With these extra insights, you can wipe out the confusions that are biting you and telling you to stop. If you want quality bathtub faucet whatsoever, then you should consider Delta Faucet U1072-PK Diverter Tub Spout and Delta RP61357BN Diverter Tub Spout. 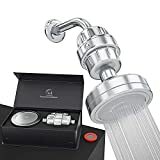 You are an elegant person, and you want aristocracy then Moen 3931 Replacement Shower Tub Diverter Spout and Kingston Brass KS266C Wall Mount Tub and Shower Faucet are our best bet. 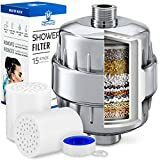 If you want a moderate option then American Standard 8888.026.002 Slip-On 4-Inch Diverter Tub, KZKJ High-Pressure Showerheads are your things. These are not low-quality products compared to high priced ones. If you have an old-fashioned tub, then go for ProPlus Diverter Clawfoot Tub Faucet. If you want bathtub deck faucet, then consider Peerless PTT298696-BN Two Handle Roman Tub Trim. 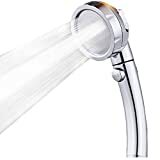 If you are searching for budget bathroom faucets, then Westbrass E531D Front Diverter Tub Spout and KZKJ High-Pressure Showerheads will do your work very nicely.